This is an odd unique forgotten horror thriller from the land down under. This Austrian supernatural flick is surprising a little gem. This is my first time seeing it and I was thoroughly entertained. I think the movie stands out and is memorable with it’s very in-depth and haunting cerebral style filmmaking. Something that stands out is the very haunting cinematography by the one and only John Seale who is a total legend. Winning an Academy Award for the amazing 1996 The English Patient and nominated for so many others including Rain Man and Cold Mountain just to mention a few. Seale adds a very intense reality to his many pictures and The Survivor is a prime example of creating something that stands out in the cinematography department. He has worked on so many of my favorite films, 1983’s BMX Bandits, 1986’s The Hitcher, 1988’s Gorillas in the Mist, 1992’s Lorenzo’s Oil, 1999’s The Talented Mr. Ripley, 2015’s Mad Max Fury Road. The Survivor is truly something that stands out as being one of the very memorable forgotten films of the 80’s, that now thankfully can be experienced in a whole new light, a flawless beautiful Blu-ray special edition being brought out by Severin Films. This is a wonderful Blu-ray. A tight refreshed picture. Vibrant in color and dark all the same with the style of film that it is. Severin Films has done a fantastic job in bringing this old gem to new light. A wonderful array of special features. Audio and Video is spot on. That is something that always stands out with these Blu-ray’s that Severin Films produces, you are getting top quality. A high definition perfection. This is based on the novel by James Herbert. Herbert was an amazing author. He was one of my favorite horror authors out there growing up. Sadly, he is no longer with us, but he left a wonderful array of novels to experience his haunting prose. 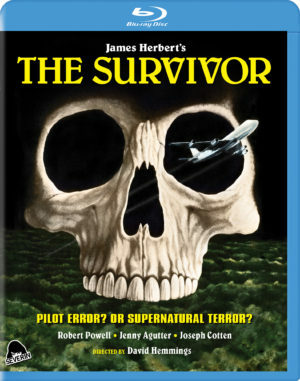 From 1974’s The Rats, to 1975’s The Fog, to the one I am writing about The Survivor. He not only wrote horror, but that is what many remember him for. He also wrote the sweet dog book which also became a movie, the book 1977’s Fluke, which became the movie in 1995, Fluke. Something that is really cool about Herbert’s writing is many of his stories has become movies. His Rats book was adapted in the horror film 1982 Deadly Eyes. His book Haunted also became a movie production in 1995. Most recently in 2012 BBC One did a wonderful production a 3-part miniseries of The Secret of Crickley Hall, which I absolutely loved. Herbert was a unique and brilliant writer that could twist and turn and alter realities, and made you believe them and the story of The Survivor is no different. A plane crashes. All 300 passengers have died during the wreck, accept one has survived. One has walked out unscathed. Keller, the pilot. Strange and odd realities take place as the truth is slowly revealed. This stars the amazing Robert Powell. Powell was in one of the greatest productions of all time Franco Zeffirelli 1977’s masterpiece, Jesus of Nazareth playing the main lead and possibly the best performance as the character of Jesus ever filmed. No matter if your religious or not one cannot deny the amazing acting by Powell in Jesus of Nazareth. Now besides the Jesus role I personally know him from his many works on documentaries as the voice narrator. He has such an amazing voice. I am a huge World War 2 buff and many of the great documentaries out there has Robert Powell narrating. Including two of my favorites The Story of the Third Reich and World War 2 HD in Color. He plays the character of Keller in The Survivor movie to a perfect clarity. This was directed by an all-around guru of entertainment. Not only an actor but producer and director. David Hemmings was a unique one of kind soul that left many wonderful examples of his uniqueness, from his acting performances in 1966’s Blowup, 1968’s Barbarella, 1974’s Juggernaut. I have to pause here and say he starred in one of my favorite films of all time the one and only 1975’s Dario Argento’s Deep Red. He died way to soon. 62 years was not fair. He had so much more to give. He acted all the way up until his death. Starring in so many greats like 2000’s Gladiator and 2002’s Gangs of New York. Looks and sounds amazing. High quality. Perfect picture. Vibrant colors. Wonderful Sound. Extended Final Scene with a running time of a little over 3 minutes and 30 seconds. Not Quite Hollywood: Extended Interviews with Producer Anthony I. Ginnane and Cinematographer John Seale. This has a running of a little over 22 minutes. The Legacy of James Herbert. A running time of a little over 9 minutes. This is a wonderful little program, a retrospect of the author. Robert Powell on James Herbert. A running time of a little over 3 minutes. Archive TV Special on Location Featuring Interviews with Stars Joseph Cotton and Peter Sumner. A running time of close to 30 minutes. Archive TV Interview with David Hemmings. Running time of close to 16 minutes. Antony I. Ginnane Trailer Reel. Running time of a little over 32 minutes. TV Spot. Less than a minute spot. Another wonderful forgotten about little horror thriller. Severin-Films did another flawless job in crafting excellence. A spot-on transfer. Wonderful audio. A unique trip back into the 80's. A high quality, highly recommended Blu-ray. Make sure you head over to https://severin-films.com/ to buy all the wonderful DVD's and Blu-rays. The main page that gives you these beautiful releases on top quality DVD's and Special Editions Blu-ray's.